He idolised the 14-time major winner when he was growing up but now believes he’s got to stand up to Woods and treat him as a rival. 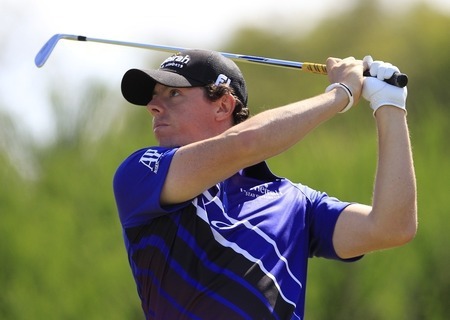 “I don’t want to feel inferior to any other golfer in the world,” McIlroy told CNN’s Piers Morgan. “If you do that then you are giving him an advantage right from the start. “Obviously I respect everything that Tiger has done and as a kid I was in awe of what he was doing. But I am supposed to be a competitor of his now. I can’t be in awe of what he does or anything like that. McIlroy revealed that his life has been a whirlwind since his eight-shot win at Congressional two weeks ago. He knows that the pressure will only grow but he hopes he can fare better in the spotlight than Woods. The American eventually lost the plot and fell from grace when his serial affairs with a string of women became public knowledge. Bracing himself for life in a bubble, McIlroy said: “It’s a tough one because as a golfer you grow up and all you try to do is imagine winning tournaments and becoming the best golfer you can be. “But you don’t realise everything that comes along with that - the fame, the attention - and it is something that I will just have to deal with. McIlroy knows it’s important to keep his feet on the ground and believes that he will do that with the help of his family and childhood sweetheart Holly Sweeney. He said: “That’s why a lot of the golfers travel with their families and with their wives. You need a good team around you to keep you grounded and keep you in check with reality and keep a sense of perspective. McIlroy lost his world No 3 ranking to Martin Kaymer as he takes three weeks off before the Open to deal with the aftermath of his first major win. The new No 4 sandwiched a trip to Hamburg for David Haye’s heavyweight title loss to Wladimir Klitschko between two trips to the tennis at Wimbledon. But he insisted he’ll be ready to go at Sandwich next week despite not playing a competitive round since his Congressional win. Before watching pal Rafa Nadal lose to Novak Djokovic on Sunday, McIlroy said: “I’ve been here, there and everywhere. It’s nice to get away from golf for a little bit and take in a few other sporting occasions. McIlroy plans to a two-day visit to Sandwich later this week and won’t return to the Open venue until next Tuesday afternoon. Norman - "Tiger will not be the same again"